If you’re a fan of fried chicken, you’ll love this healthier alternative!! These Oven Baked Chicken Legs are breaded in a light, crispy coating that’s full of delicious seasonings, and then BAKED instead of fried! When I’m feeling motivated to eat healthier, it seems like chicken is all I eat. Even though there are so many wonderful ways to make chicken, it can still get a little old sometimes. So, we’re always on the look out for new ways to switch up our chicken dishes, like this Oven Baked Chicken recipe that we are sharing today. 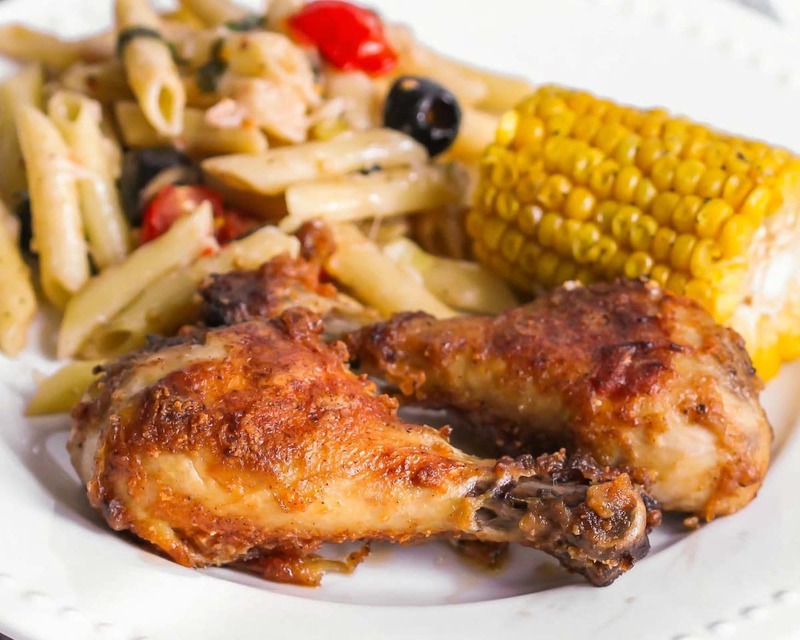 These drumsticks were easy to put together and were a HUGE hit with everyone in the family. The batter coating the chicken is light, tasty, and just perfect enough to make you lick your fingers. The best part is that it tastes just like Kentucky Fried Chicken but they’re not fried at all – they’re BAKED!! I was surprised that they tasted so good for being baked, but they were, which means I’ll feel less guilty when I have a few. 😉 Not only did these chicken legs taste amazing, but they were easy to throw together! When a recipe tastes this good and is this easy, it’s a winner in my book. 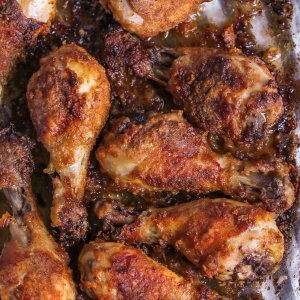 If you’re a chicken lover like us, you’ll definitely enjoy this simple and easy oven baked drumsticks recipe. Start off melting a little bit of butter in your 9×13 pan by placing it in the oven. While the butter is melting, mix together the ingredients for the breading. The breading is SO delicious, and it only requires these few ingredients! Coat each drumstick in the mixture, and then place in the pan with the melted butter. Once they’re all breaded and in the pan, spray lightly with the spray butter and then place in the oven. Bake at 450° for 30 minutes, then remove from the oven, flip each chicken leg, spray with butter once more, and then bake for an additional 15-25 minutes, until they’re as crispy as you want them to be. If you're a fan of fried chicken, you'll love this healthier alternative!! 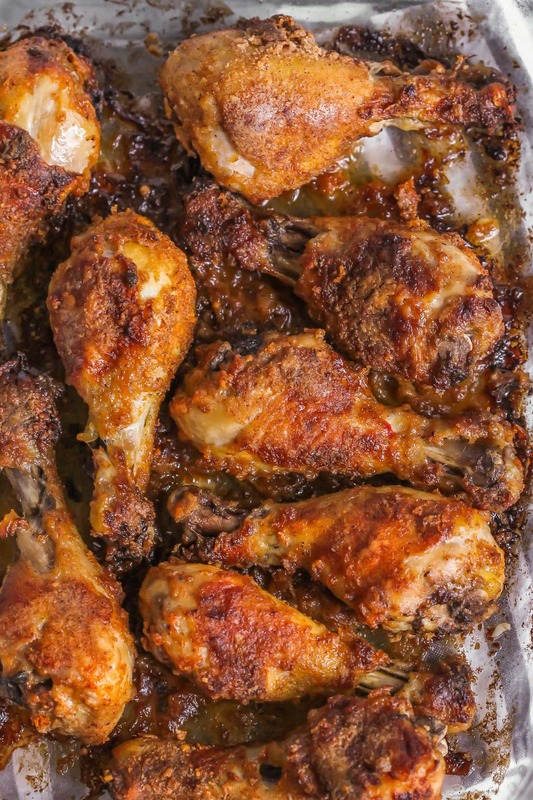 These Oven Baked Chicken Legs are breaded in a light, crispy coating that's full of delicious seasonings, and then BAKED instead of fried! Melt butter in a 9x13 baking dish in the oven. While butter is melting, stir together Bisquick, paprika, salt and pepper in a bowl. Coat each chicken drum and place in 9x13 with melted butter. Spray with butter before putting in the oven and once during baking. Bake for 30 minutes, flip and bake an additional 15-25 minutes. ENJOY!! What do you do with the butter once it’s melted? Add it to the dry ingredients or baste the chicken with it before coating it with the dry ingredients? You leave it melted in the pan & the chicken goes on top of it 🙂 Hope that helps! O.k that was an answer to my question!! Do I pour the butter on the chicken or in the pan? What do I do with the spray butter? I haven’t tried, but it should be ok. Let me know how they come out! Thanks so much!! I would cut down the sauce next time. It was a little salty. I dipped the chicken in the melted butter first and then to the mixed ingredients. Thanks so much for sharing!! You definitely can take some salt out. I’m glad you gave them a try! This looks so good! I added it to my menu plan for next week 🙂 What do we use the spray butter for? Definitely not the 9×13 since it’s plenty buttered already, right? What is bisquick mix? I’m from Sweden so If I know maybe I can find the Swedish equivalent. It is a pre-made baking mix. People use it for pancakes or like breads. Hope that helps!! Can someone answer what was asked, what is the purpose of the spray butter? We use the spray butter to coat the chicken before putting in the oven, to give it that crispy, golden taste. We also sprayed once during the baking process. Hope that helps everyone 🙂 Thank you! This looks delicious but we’re not drumstick fans…can this be done with wings instead. How long should I bake them??? I haven’t tried that. I’m not sure what the baking time would be for those. Maybe a little less, since they are smaller?? I’m sorry, I wish I knew. BUt, those would be so good! The step about how to use the spray butter seems pretty important – maybe consider adding it to the instructions? Making this for the 2nd time now, btw, since my kiddos loved it so much plus we’re bringing dinner to a friend and these make plenty to share! I’ve added it, thank you 🙂 I’m so glad you all like it!! We make it all the time now, ourselves! I don’t actually see where you added any instructions to spray with butter again during the baking process! HAS ANYONE USED BONELESS/SKINLESS BREASTS? WHAT ARE THE VARIATIONS IF SO? I tried the boneless skinless chicken breasts, they were really good. My husband likes legs & thighs & I like breasts so I just did what the recipe said but I baked everything 25 minutes on each side. We really like it. What is spray butter? Pam? But is there a brand name for spray butter? I think PAM is a spray oil. I use…I Can’t Believe it’s Not Butter spray. I am sure there are others, that’s just what I have. Hope that helps!! Another spray “Butter” is Parkay Spray. The reason I know this is my son has pancreatitis and can have no butter or margarine with fat. I hope this helps! Thank you for sharing that Sharon! This is the best, most tasty, crispy skin, baked chicken I’ve ever had! I had saved this recipe for sometime and finally made it this week. I added 1 & 1/2 tsp. garlic powder to the flour mixture and used Smart Balance spread instead of butter. I also used a whole chicken that I cut up myself. I then sprinkled the remaining flour mixture over the chicken prior to cooking to see if I’d get more of a flavorful coating-it worked! I don’t know if the “I Can’t Believe It’s Not Butter” spray is the game changer, but I’m not going to change it! It was simply delicious! I liked it so much better than cornflake baked chicken. The skin actually crisped up with the flour coating. I feel cornflakes get too mushy. Thank you, so much, for sharing this with us! I’ll never crave restaurant fried chicken again! I Am in the mist of making this…don’t have spray butter. Canola spray I have. What should I do? Tried making these. Butter splatters all over oven. I do not have a self cleaning oven. Any suggestions how to make these so butter won’t get all over? Hmm..I’m honestly not sure? Mine didn’t splatter all over, but maybe you can just do a smaller amount? I made this recipe tonight, It was very tasty. The only thing I did differently was melt more butter and brush it over the chicken since I use only real butter and no margarine/spray butter. I served it with cheddar Bisquick biscuits with garlic butter and a salad. Very good dinner thank you for the recipe. What is the recipe for the salad pictured? The video says to bake for 15 minutes then flip & bake for an additional 15 minutes. The written recipe days to bake for 30 minutes then flip & bake another 15-20. Which is correct? It’s 30 min, then an additional 15-20. Sorry for the confusion. ENJOY! What is the pasta dish on the plate? It looks so good! Did you put foil in the bottom of the pan? I made this chicken tonight…..we had some legs left from the weekend. I was going to do my moms tried and true recipe but thought I’d try something new. Found this recipe which was exactly the same as moms except it called for bisquick vs flour. We were going to meet friends so I did timed cooking. Since we were going to be gone for a few hours, I cooked the chicken for 2 hrs at 300. All I can say is HOLY COW! BEST chicken EVER! My husband just kept raving about it! Tender, juicy, delicious!!! I love, love, love to hear that!! I am so glad you all liked it!! Thank you for giving it a try! I don’t see how some of u guys are not getting the recipe It tells u to the t what to do. This chicken is amazing! my family devoured it. I loved how crispy it was & the taste was delicious! no need for kfc! We all love this chicken!. The little ones and the adults. Since its all drumsticks its easy to eat and very easy to put toghether. It has a great tAste with a crunchy coating and no frying! as bad as it sounds, I could eat these drumsticks all day! great idea. Also, at first I was going to skip the coating due to gluten trouble but then I realized i have gluten free bisquick like substances. Thanks for thE recipe. These sound great and I added them to my air fryer recipes. The coating sounds light and thin, and I will add some garlic powder. Try them in your air fryer and let me know how they turn out. I definitely will!! Thank you!